Cessation of hair loss, increased re-growth of hair with improved hair quality. Increased circulation in scalp blood flow. The results of these clinical studies are to be published in scientific journals. A double blind comparative study of laser treatment with placebo laser (LED)5 for treatment of Hereditary Alopecia in young males. Abstract: A double-blind placebo controlled study was carried out to evaluate the effect of laser therapy by comparing Laser Hair Therapy 4000 (InGsAl, 670 nm) and a placebo laser (LED). The duration of hair loss and baldness, according to Hamilton Classification, were recorded. A skin biopsy for histological examination was taken before and after treatment. In addition a photograph was taken of the patient at the same time. Hair shaft thickness was measured with hair stretching equipment where the hairs can be stretched on a graded scale from 0-10, normal value of the hair shaft being 0.5. The results were confirmed by histological examination. 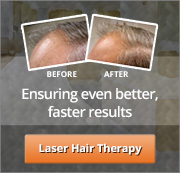 All patients with the exception of one in the laser-treated group showed a complete cessation of hair loss. All patients except 3, showed a clear re-growth of hair with a reduction of at least one category in the Hamilton classification. Pre-treatment typically showed the dermis with large, relatively normal amounts of follicles. Most of them were in the telogenphase and did not show any real hair. Some of the follicles were widened with keratin taps at the follicle opening. Post-treatment showed the dermis with almost the same amount of hair follicles as pre-treatment, although a number of new follicles could be seen with clearly noticeable hair growth. 50% of the follicles were now in the anagen phase. A clearly visible re-growth of hair was found in post-treatment sample comparison. When comparing the histological findings, transformation into more anagenic hair follicles could be observed in 83% of the patients on laser treatment, but in none of the placebo patients. Out of 18 patients, 14 showed an increase in hair thickness, and all 18 patients showed improvement in general hair shaft quality. When measured with the hair stretcher, the results showed no improvement in the placebo group or any adverse effects of the treatment. The present double-blind study definitely showed that re-growth of new hair can be achieved in most middle-aged and younger males, with typical male pattern baldness, when the scalp is irradiated with Laser Hair Therapy 4000 for 15 minutes twice weekly for 5 weeks, with follow-up maintenance treatments. Client/patient undergoing treatment with Laser Hair Therapy 4000 may experience a sensation of heat, accompanied by a tingling feeling from the scalp to the neck during treatment. Laser Hair Therapy 4000 has no thermal component, and the warm feeling can be attributed to stimulation of microcirculation of blood supply. Furthermore, initially an oilier scalp is often noticed. The scalp usually normalizes after two to four treatments. Conversely, a scalp that was oily before treatment will normalize in the same way. This condition has not been fully explained, but is believed to be the result of the normalization of the sebum (lipid) secretion from the sebaceous gland during treatment, after inactive hair follicles have been stimulated; the sebum (5a-reductase) is thought to play a role in hair loss and re-growth. The described reaction to treatment is a natural reaction, which indicates that the therapy is working. The effect of hair lasers on skin blood flow. Abstract: The effect of hair lasers on skin blood flow were measured on three different devices to establish the effect of scalp blood flow. The hair lasers used were Laser Hair Therapy 4000 (InGaAl, 670nm) with 30 rotating diode lasers, an Italian manufactured laser (HeNe, 632.8nm) marketed as the Boston Laser, and containing a single laser transferring light via lenses to the patient, and a laser identical to Laser Hair Therapy 4000 in which the 30 diode lasers were replaced with (placebo) Light Emitting Diodes (LED). The differences in the laser systems are illustrated by the fact that Laser Hair Therapy 4000 increased scalp blood flow rate by 54%. The HeNe laser, or Boston Laser, had no effect, and the LED (placebo) decreased the blood flow rate by 36%. In addition, skin temperatures measured before and after the treatment showed little change. In 1984 Dr. Trelles showed in one study that patients with alopecia areata who were treated with HeNe Laser 632.8 nm showed a good response. Dr. Trelles reported that most of the patients with alopecia areata responded well after only 6 to 8 treatments administered twice a week for four weeks. The HeNe laser was placed 30 centimeters from the alopecia area with dosages ranging from 3-4 joule per sq.cm. No fibers or lenses were used. In the same study, microscopic evaluation of the hair shaft structure on the alopecia areata irradiated areas showed a clear modulla rich in Keratin after treatment.